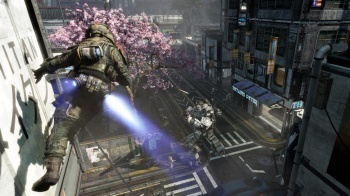 Titanfall employs some neat design tricks to keep players active instead of waiting to respawn. Multiplayer shootouts are often great in theory, but substantially less interesting when you can't survive for ten seconds without another player effortlessly gunning you down. Luckily Respawn Entertainment (the team behind Titanfall, with several former Call of Duty developers) has been in this game for a while now, and the developers have a few ideas on how to keep things fun for everyone. A clever blend of player empowerment and AI combatants helps players stay engaged without driving anyone to ragequit. Titanfall makes it relatively easy to stay alive. On foot you're very agile and hard to hit, while Titan mechs are durable and give you a chance to eject before dying. "It's not boom-you're-dead, boom-you're-dead," says producer Drew McCoy. Meanwhile, AI-controlled soldiers are not nearly as resilient. "AI grunts keep that quick time-to-kill feedback loop," McCoy explains. "When you can kill three guys in eight seconds, that's good - but when you're on the other side of that, it's not." The disconnect between players and AI troops is deliberate: these aren't "bots" in the traditional sense. "They're not meant as a human replacement. They're a different class of people. Pilots are these super-awesome soldiers that have the gear to do double jumps, the weapons to take down Titans, but the AI are the low-level guys that are always on the ground ... they show new players where to go. And once they start fighting, they're usually fighting other AI because all the experienced players are fighting on walls and rooftops. New players start getting kills on AI, when usually in multiplayer games they're getting completely whacked." The end result is a unique kind of battle, where every player can mow down squads of enemies but player-against-player encounters are intense skirmishes. It seems like a solid way to manage the learning curve of a multiplayer-only game; with no campaign to learn the ropes from, new players had better hope that Titanfall's AI goons make for good target practice.